#3 of the Five Columns, known as the Charming Amethyst. Her interest in Natsuki seen in the original Mai-HiME seems to be upgraded in this series to an actual relationship. She permanently resides with her in the Principal building, when she's not on missions for Garderobe. 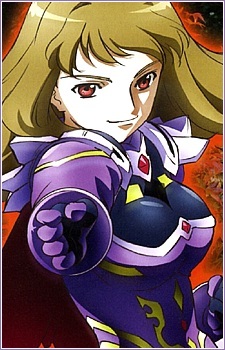 Shizuru is from Wind Bloom, and she was classmates and rivals with Haruka. Her element is a naginata double-edged sword whose blades can extend in a whiplike fashion, much like her naginata did in Mai-HiME. Her reason for fighting is to "protect her most precious person."